April | 2014 | Careerschap | The musings of a careers professional in the higher education sector. I’ve just finished reading “The future of work: jobs and skills in 2030” which is a must read for anyone with an interest in the trends that will shape future UK jobs and skills. The 198 page document was published on the 28th Feb 2014 but is fortunately made more accessible by the smaller “Key Findings” report and the very user friendly “Slide Pack” which contains bite size infographics of the main topic points. Although it has been written in a UK context the globalised nature of trends and influences the report mentions applies to every country. Jobs and skills are universal, which perversely, is exactly why trying to predict what the economy – and global economy – will look like in 2030 is so hard. However, the UK Commission for Employment & Skills performs an admirable job in the face of such uncertainty and chaos. “This report presents the results of The Future of Work study which looks ahead to the labour market of 2030. It analyses stable trends that are already shaping the future of UK jobs and skills, and forecasts the most likely disruptions to those trends. It then plots four anticipated scenarios of what the UK’s work landscape might look like in 2030, and importantly, the skills that will be required under these conditions”. “This research is based on a robust, evidence-based approach including an analysis of more than 300 publications related to the future of jobs and skills and additional desk research. In addition, interviews with 23 UK and international experts (see Appendix A) validated and enriched the collection of trends and descriptions and shared their expectations and future perspectives from their field from a bottom-up approach”. Firstly the report identifies and focuses on 13 key trends such as demographic change, desire for a better work-life balance and ICT development and the age of big data. It attempts to foresee the impact these trends will have on individuals, employers, education and training provider and policy makers. The report then identifies what it calls “10 key disruptions” to the underlying 13 trends with each having the potential to impact and deviate events and the future (think the Butterfly Effect). What emerges is the potential for four possible scenarios that could play out for the UK economy. Greater business flexibility and incremental innovation lead to moderate growth in the economy, but this flexibility often results in fewer opportunities and weakened job security for the low skilled. Despite robust growth driven by strong high-tech industries, a two-tiered, divided society has emerged, reinforcing the economic position of the ‘haves’ and ‘have nots’. Technological innovation drives the automation of white-collar work and brings large-scale job losses and political pressure, leading to an extensive government-led skills programme . In a stagnant economy, improved productivity is achieved through a rigorous implementation of Information and Communications Technology (ICT) solutions . These four scenarios then provide the basis for potential implications to seven major employment sectors in the UK in terms of jobs and skills. From a career guidance perspective several extracts resonated and have implications for our practice. Implications: We cannot be closed systems ignoring the outside world. Metaskills are essential to adapting and improving existing skill sets. How can our education system and CEIAG support this? “As the world of work becomes more flexible, employees are expected to shoulder more and more responsibility for skills development. Self-management, alongside core business skills, such as project management expertise, and the ability to promote your personal brand, will become increasingly vital”. Implications: We own our career not our job. CPD is a vital commitment alongside self awareness to accurately analyse our current offer to employers. We need to be open to exploring learning through various contexts and methods. The classifying and matching paradigms of old are not helpful in a world of constant change and transition. We need to embrace the challenge and opportunity of uncertainty such as chaos theory. Summary: I really have glossed over so much from the report and missed some vital insights. What does emerge are potential strategies and actions we need to take in order to better navigate complex dynamical systems. I would encourage you (if you’ve read this far!) to take a look at The Future of Work – Jobs & skills in 2030 if you want to better understand some of the challenges ahead for us all! Making the most of LinkedIn. 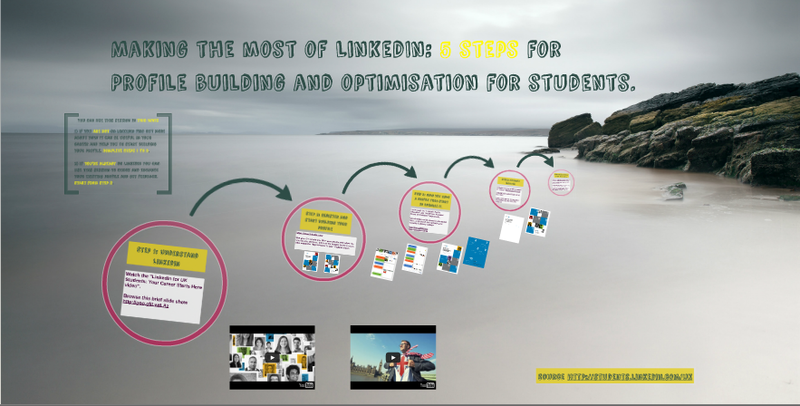 A useful Prezi for HE students. I did try and embed it but embedding a Prezi into wordpress.com is extremely temperamental (not really supported) so the link for my Prezi is here. I also found this useful Prezi entitled “The 5 Metrics You Need to Know to Give a Great Presentation”. I find with presentations that it’s easy to over complicate but difficult to simplify. Go figure! So what is success? I don’t mean the dictionary definition, instead I want you to think about and visualise in your mind what you believe your future life (you choose the time frame) should look like in order for you to feel it has been successful. To make this work I must stress the word “feel“. Take your time and really reflect about this. Think about where you are now and where you want to be in order for you to believe that the vision you have would make you feel like you had been successful. So what have you created? Possibly a mental check list – wealth, happiness, nice car, big house, power, influence, respected, a final vision or outcome – I’m sat on a beach in front of my private villa with my business running itself without a care in the world or maybe it looks more philosophical and involves living by a set of values and morals and being true to that (so not so focussed on an end goal or tangible outcomes). There are not many guarantees in life from this point on apart from death and taxes but I can offer one such guarantee. That your vision is truly unique and different from anyone else’s. In other words – from a constructivist perspective – your vision/construct only exists in your head and no other. Following the constructivist view further, if what you imagined is your current version of success, then that is indeed what success is to you. As such, it is your success and no one else has ownership of that. So what we have in the world is several billion constructs to the question I posed at the start of this blog entry. So let me tell you what got me thinking about this and where I am going with it. I read an article from Business Insider entitled Here Are The Major Differences Between Successful And Unsuccessful People. The postcard in the article came from Andy Bailey who is CEO of Petra Coach. The article made it on LinkedIn here and to date has had 557,991 views, 10,496 likes and 1,887 comments. How we view, value and think about success and becoming successful clearly resonates with a lot of people and created plenty of conflicted discussion in the comments section. What is interesting is that despite success being a deeply personal, subjective and unique standpoint individuals/groups/society attempt to exert nomothetic conformity and right/wrong scenarios or in the case of the article a collection of actions/traits aligned to successful/non-successful people. Now, I’m not being obtuse. I realise that these traits do not explicitly define what success is, but more like if you acquire these traits and perform these actions you are more likely to be successful. Or following this logic further, this works for me and it can work for you too. We need context here. The author of the postcard is a CEO (some might say that is success). To move up in his world this is what he perceived to be of value to him and worked. We assume he attached value to these traits because they then shared this with others. I see issues with this from a career guidance perspective in terms of how useful is it to just share a set of actions/traits in order to achieve success. If I use the example of a cookbook to create a cake, we can be told the ingredients (traits/actions) and shown the recipe (combination order of actions/traits ) and still have something at the end that tastes awful/great (success/failure). However, we know with home cooking that what may taste great to you might taste quite horrible to someone else. So who is right? Do we need to decide someone to be right (positivist view)? Are we both right? (constructivist view). Let’s muddy the cake mix mixture further. For James Altucher, in his key influencer article on LinkedIn, suggests abundance will never come from your job and you need to choose yourself for success and quit that job, which is certainly a diametrically opposed viewpoint to climbing the corporate ladder. So the values/actions/skills/traits for one construct of success may not be useful for another construct. 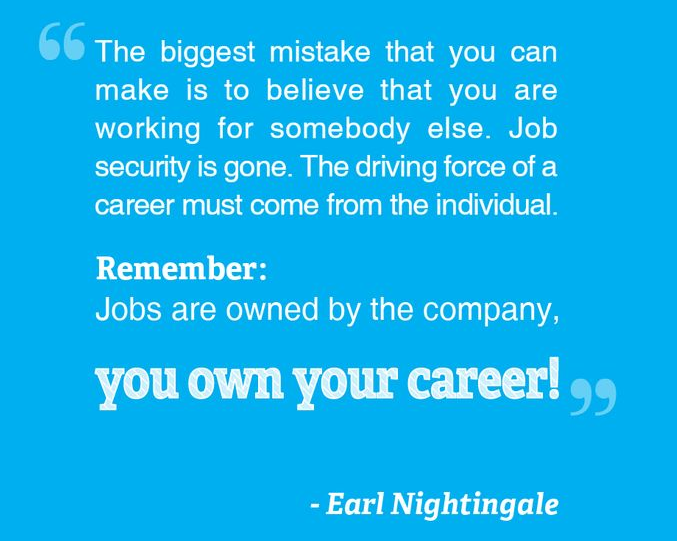 Which leads into what Earl Nightingale has been saying all along. So who owns your job really? In the context of my own work in higher education I see the process of results orientation and prescribed success becoming increasingly prevalent in the sector. Getting a 1st or 2:1 and an observable set of skills and traits is highly valued as a key indicator of performance and success. Just look at the DLHE (destination of leavers in higher education) survey organised by HESA and how the results are presented. My colleague Tom Staunton wrote a really thought provoking piece called HE Careers Learning Outcomes which certainly got me thinking that the aim is just as important as actually getting there. So not understanding your aim and how that was constructed in your mind can have consequences. I see this manifesting itself in the students I see. Striving towards a set of goals that were not constructed but transferred and adopted from a systemic set of values and indicators for measuring success for higher education students. The media also plays a huge part as well (and I include social media in this of course) but there is some balance out there like this article in the Guardian. So what are the potential implications for careers professionals in all of this and what can we do? Be introspective: What is your view of success and why? (back to what I asked at the start of this piece). Be conscious about how this paradigm shapes the guidance you give to others. Be conscious of your approach to guidance: We all do things differently. But identify what is your current approach/model and how does this interact and influence how success can be achieved for a client? Do I help the client construct their own view or am I taking a matching approach to my guidance practice? Focus on failure: We can spend too much time in the process of actioning success, without acknowledging the crucial role our failures play in shaping what success actually means for each of us. Failure is good if we learn from it. But interestingly even though failure is a vital component of performance improvement you won’t see too many articles which read “how to achieve failure”. So we need more balance and focus in our work which incorporates what success looks like to each of us as well as how this construct interacts with our practice and the billions of other constructs that exist.